Artivity - Open Source Reporting and Documentation for Digital Artists. 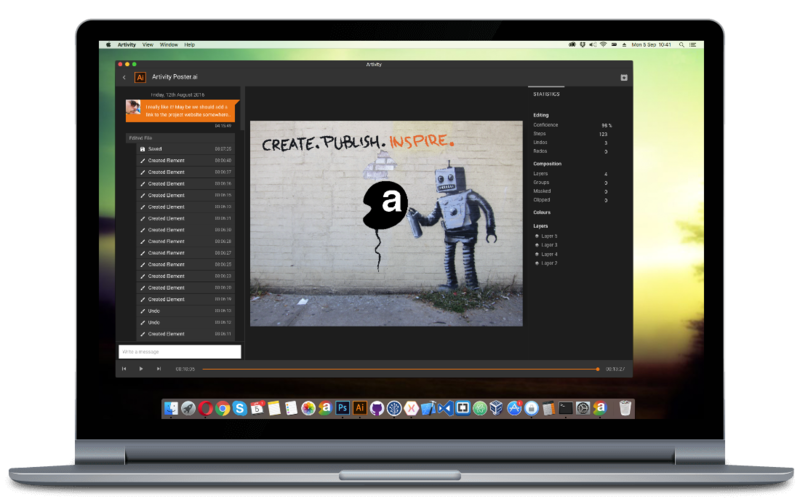 Artivity enables you to easily record and share the entire creation process of your digital artwork. Supports Google Chrome and Adobe CC 2015 or later. Understanding the techniques of artists is an essential part of studying art and art history. The process of creating an artwork is often more valueable than the artwork itself. In traditional art historical discourses, art forms such as painting, sculpture and printmaking, can be studied by technically examining the artwork for evidence of technique. In digital art, this evidence are often lost as soon as the editing session on a piece of software ends. Artivity can document the creation process of your digital artwork. This is critical for attributing art which is increasingly shared online, but also for interpreting individual artworks and their context within a given social and technical environment. It is a long term self archiving tool which does not intefere with your practice. Artivity is easy to use and does not interfere with your practice. After installing, there is nothing else to do but to start creating your digital masterpieces. You can easily publish and share your work with others. Artivity works transparently in the background and does not interfere with your creative process. It records the editing history of your files through plugins for the featured creative tools. If necessary the data for unpublished files can be deleted automatically after a configurable period of time. You can publish your work to online eprints.org repositories. Before publication you can always review the data being transmitted and - if necessary - remove anything you don't want to share. Published Artivity data can be used to replay the entire creation of your work and it provides a great source for research and inspiration to others. In the future you may allow other users to comment on your work so that you receive specific feedback on your method. Artivity works transparently in the background and does not interfere with your creative work. The main user interface is a list of your recently edited files which you can choose to publish or archive. Every step in the creation process of your digital artwork is recorded and can be published online. Artivity data is personal and by default stored on your computer. No data is transmitted to online servers until you explicitely choose to as part of the publishing process. You can always review the data before it is published. The software runs on all modern desktop operating systems, including Mac OS X, Windows or Linux. It also supports a continuously growing number of creative tools. Artivity data is formatted based on open standards issued by the World Wide Web Consortium. This ensures that it can be archived and remain readable in the future. Our software is Open Source. This means everyone can participate in its development or review its source code. If you want to know what goes on with your data, you are free to check it out. Your privacy matters to us and we protect it. This software has been produced as a result of a research project of the University of the Arts, London. The project is monitored by the University's Research Ethics committee. You can find the University's Code of Practice on Research Ethics here. Artivity is funded by JISC. We do not collect or sell any personal data. The Artivity open source software is developed by Semiodesk GmbH in partnership with the University of the Arts, London. The project was initiated by Dr. Athanasios Velios at the Ligatus Research Centre. It is funded by JISC since March 2015.